Combat breakage and split ends in force! 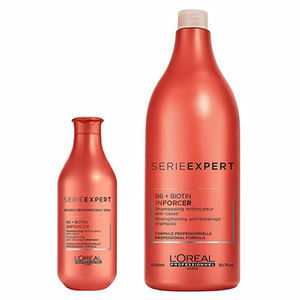 L'Oreal Professionnel serie expert INFORCER Shampoo has been specially formulated to target breakage and split ends to leave hair soft and healthy. It's enriched with Biotin and B6 which are known for their strengthening properties and is especially effective on long hair. With continued use the shampoo can help the hair to become more resistant and stronger. For best results use with L'Oréal INFORCER Conditioner. N.B. Pump for backwash size (1500 ml) is sold separately. £8.64 (inc. VAT) Why no VAT? We're a trade wholesaler and quote our prices without VAT to help our VAT-registered customers understand the true cost of a purchase. Designed for série expert salon-sized bottles, this pump makes it easy to dispense the right amount of shampoo and conditioner when you have a client at the backwash. Comes in 3 sizes: 750 ml, 1000 ml or 1500 ml. Caring conditioner that has been specially formulated with Biotin and B6 to target breakage and split ends. Strengthening mask formulated with Biotin and B6 to strengthen longer, fragile hair, reducing breakage and split ends.